Back at CeBit 2014 we ran a news item regarding a couple of Sapphire branded AMD GPUs that used double the video memory of the standard R9 290X. It was going to be an interesting exercise to see if Sapphire were merely showing units and gauging interest, or if they were actually going to come to market with these 8GB behemoths. It would seem the Vapor-X model is at least hitting the shelves, although with only one retailer for a worldwide exclusive. For normal 1080p gaming, most graphics cards come with 1GB or 2GB of video memory alongside the GPU. This for all intents and purposes covers most games at this resolution. When the resolution starts increasing, to 1440p, 1600p, 4K UHD or even multi-monitor, then numbers such as 3GB and 4GB become more relevant, especially when running the high resolution texture packs on games such as Skyrim. In these situations, the more video card memory you have, the less likely it is to be a bottleneck in performance. 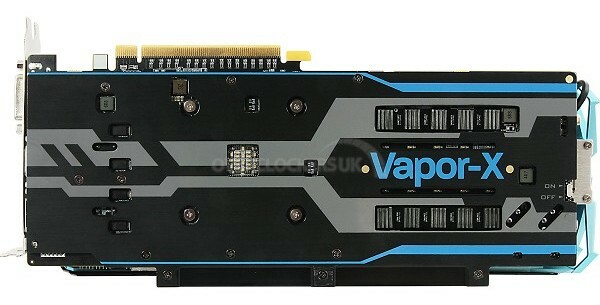 Up until this point, the biggest single graphics processor cards on the market had 6GB (GTX Titans and a Sapphire HD7970), and to get higher required the professional level workstation cards. 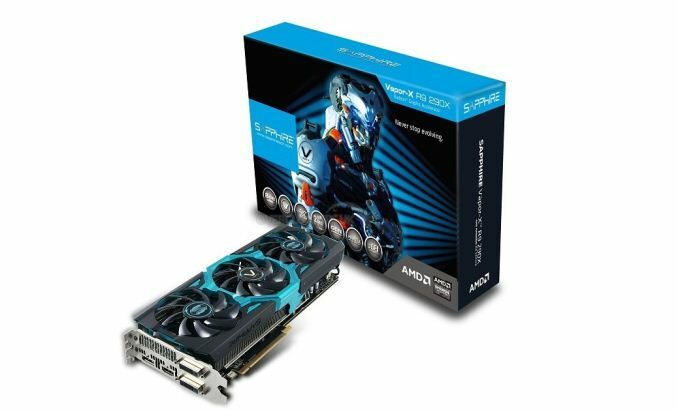 However Sapphire has once again released a double memory GPU, giving their R9 290X Vapor-X 8GB model. Specifications give us a 2816 SP Hawaii XT GPU overclocked to a core speed of 1060 MHz in turbo mode. The memory is set at 5.6 GHz, with two dual-link DVI ports, a HDMI port and a DisplayPort. It requires two 8-pin connections for power, and the use of a 600W PSU is a recommended minimum. The Vapor-X cooler is there to reduce temperatures, and Sapphire is also promoting a patent-pending choke design to offer 25% more power efficiency than the standard. A new addition to the Vapor-X line is Sapphire’s Intelligent Fan Control, which means that only one fan will spin while under simple 2D workloads. The price for this card is £600 inc. VAT (or £500/$848 ex. 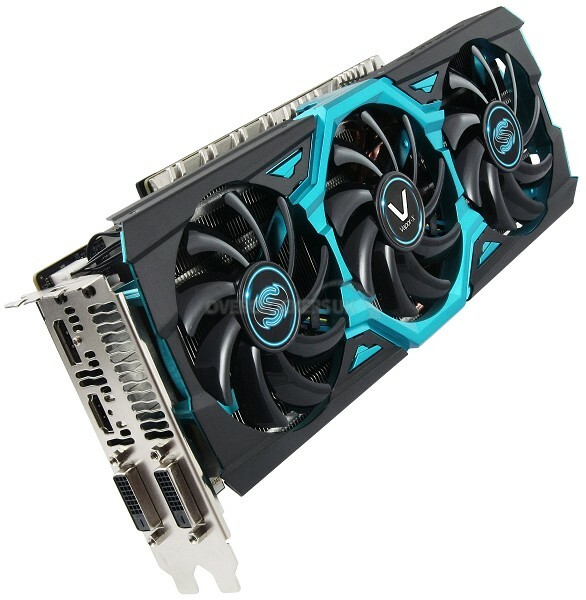 VAT), compared to the 4GB model which retails for £492 or the R9 290X Matrix for £540. Part of this price will be the memory, and another part of it might be the exclusivity. I'm currently asking how long the exclusive is for. It comes with a two year warranty and six free games. The retailer is OverclockersUK, who just happen to employ the world’s number one overclocker Ian ‘8Pack’ Parry. We interviewed him last year at the launch of his personalised 8Pack range of ‘world’s fastest systems’. Part of me wonders if some of the OcUK stock is going to be funnelled into a new project for high performance combined with resolution gaming. In the meantime, OcUK seem to have plenty of stock for users willing to pay the premium. Additional 5/8: I have been told that the entire stock of 8GB Sapphire models are solely for OcUK (and possible partners outside the UK), meaning that if there is interest outside the UK, Sapphire will have to make some more. Unfortunately what I am hearing suggests that no more will be made. "and the use of a 600W GPU is a recommended minimum"